CONSERVATIVE ENVIRONMENTALISM: OXYMORON OR VIABLE SOLUTION? Dan Dagget began his activist career protesting strip-coal mines in the 1970s and later became one of the early members of Earth First!. His passion in the environmental movement has led to the Sierra Club naming his as one of the Top 100 grass roots activists in 1992. Dan specializes in land management issues in the American West and over decades of experience, came to believe that approaching environmental issues in the West under conservative principles of free market and responsible ownership of land to farmers and ranchers, was the better solution to current “big government” efforts to nationalize and fence off land in order to “preserve” the environment. 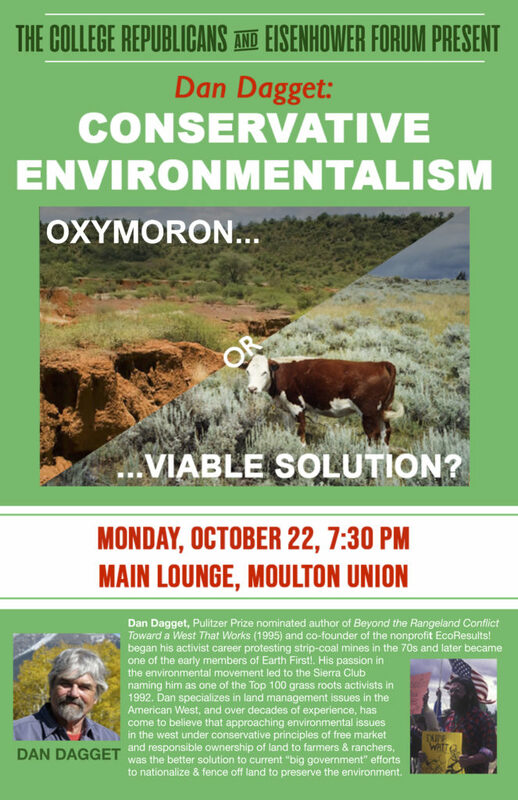 Please join for a thought-provoking lecture on current environmental issues facing the American West and an exploration on the role of conservatives in the environmental movement.